Sorry, we are currently sold out of 'Krunch Monkey Overdrive'. Please check back later. 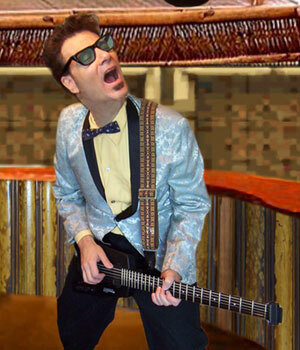 The sample labeled "Arpeggiated" was performed/produced by Vinnie Zummo using a Steinberger Transcale. Krunch Monkey™ is is an incredibly unique and musical sounding overdrive with a very warm and throaty tone. The tone features incredible clarity and rich harmonic content, while offering the player expressiveness, and versatility. Krunch Monkey offers a mini toggle switch between two modes via a mini switch. In siicon mode you will get a smooth yet fat crunch with plenty of rich gain, similar to that of a TS808. In zener mode you will get a more "brown sound" that is more tube like, as well as being a bit deeper and darker. 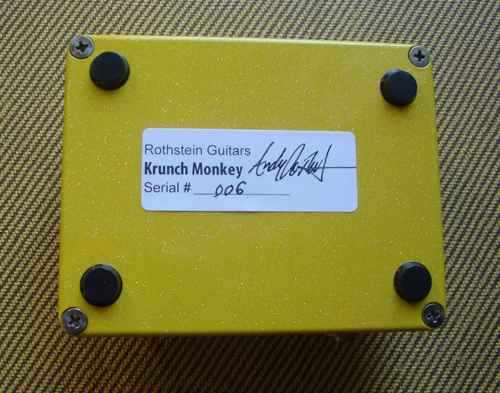 Inside the Krunch Monkey you will find nothing but the finest top-quality full-sized components that have been hand wired by Rothstein Guitars. Mini Switch - to toggle between silicon and zener diodes, althering the chacter of the overdrive. Krunch Monkey features 2 internal trimpots. They are set during production and do not need to be adjusted, but they can be tweaked by the customer to taste. Contour- This is a subtle tone control that allows you to shave off some of the high end. You might adjust this if your rig is particularly bright. Voice - This is a "bias" pot, but you can think of this as a kind of "voice" control for the overdrive. I really think all overdrive pedals should have something like this. 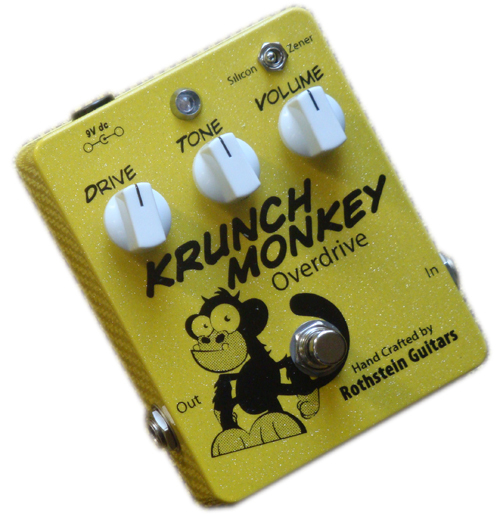 The reason we provide it is because the Krunch Monkey will react differently with different guitar/pickup combinations, so this gives you control over the final character of the overdrive. Ultimately it affects the amount of juice the transistor is getting. Krunch Monkey features true bypass. When bypassed, the signal goes directly from the input jack through the switch to the output jack with no connection to the circuitry in the pedal whatsoever. Krunch Monkey includes a great sounding buffer. Unlike the TS808, the buffer is bypassed when the pedal is bypassed. The buffer provides the pedal with a nice high input impedance (1M) and low output impedance (10K) so it will interact nicely with any of your other pedals. This will be particularly useful for players who like to place a wah-wah before the overdrive, as the buffer wil enable you to hear the full range of the wah. Krunch Monkey features a Powder coated finish with professional screen printed graphics. It is available in 2 colors: Yellow Sparkle and Jersey Cream. Low power consumption, so the battery should last for months provided you unplug the guitar cable from the input jack when not in use. Measurements - 4.7" x 3.7" x 1.18"
"At any given time there are a plethora of new distortion/fuzz/overdrive pedals on the market. Most are variations on one classic sound or another. Once in a while one comes along that has a distinct voice of it's own. That would be the Krunch Monkey. The KM is rich in both character and versatility and it allows you to mold the sound you hear in your head. A sound rich with meaty mids, throaty harmonic content, and expressiveness. I recently used it for tracking a song on my new album and I dialed a great Beatley arepggiated sound in in about 10 seconds. U plug it in and it sounds great. What more could you want from a piece of gear?" 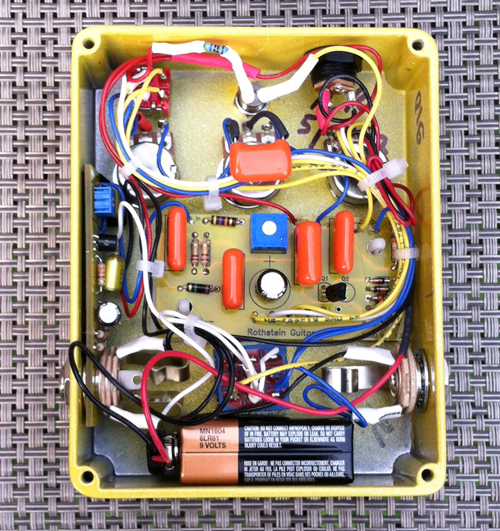 "Being one of the first to hear, see and test the Krunch Monkey Prototype I can not only attest to the quality of the components but the high quality craftsmanship that went into this amazingly transparent and useful overdrive. Unlike the TS 808, OCD and other overdrives of this sort the Krunch Monkey does not color the tone or distinction of the guitar, or more importantly, the player's dynamics. Smooth tones from a subtle fuzz to an impressive growl make the Krunch Monkey a worthy Simian King in the world of worthy overdrives. " " Bought and played many overdrive pedals, many of them had a good rhythm tone but the lead tone was muddy, or vice a versa. The Krunch Monkey solves these issues. It has a great marshall like overdrive tone in Zener mode, and with the flick of the switch you get a smooth 808 type overdrive in Silicon mode. Rhythm and the lead tones have real note clarity that cuts thru the mix. It's my swiss army knife of overdrive tones! " "Andy - I really like the Krunch Monkey! I've dialed it in to a sort of fuzz/crunch combo. I'm playing with it through a Matchless spitfire and it really sounds great. Thanks for the great products. I also have one of your passive midrange pots in my strat and love it too "
"Buying the Krunch Monkey was a great choice. I front a punk band and I hate sounding like anyone else. it took a long time for me to find that tone I was after. What came to me as a great surprise was that the Krunch Monkey not only has many unique harmonic 'imprints', but I can change the tone from light to dark with the flip of a switch. We play different styles so I was looking for a 'bread and butter' overdrive for straight rhythm. When you play light or low, there is no signal loss at all with the Krunch Monkey. The customer service is excellent too. " 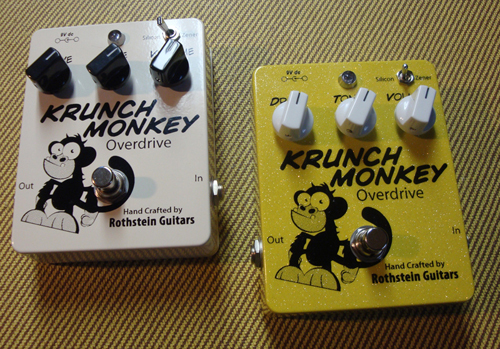 "I have played many overdrive pedals and the Krunch Monkey stands out for several reasons. For starters, it has a nice gritty tone that sounds amazing with my Tele, especially in silicon mode. Secondly, flipping between diode modes gives me great tonal options. Lastly, it is dead quiet � no hum or buzz . The Krunch Monkey is definitely a keeper!" Note the use of only the top quality full-sized components.